What a fabulous day at Wimbledon Tennis yesterday. I was lucky enough to sample our own hospitality at Wimbledon this year and to remind myself what a truly great day it is. 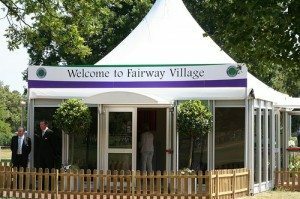 Far from the maddening crowds, sun and heat we enjoyed morning refreshments at The Fairways Village. Driving into Wimbledon to the Wimbeldon Tennis Championships is very slick indeed, no traffic at all. It is interesting to compare this to other major events, eg Open Golf Championships etc, where the surrounding country roads just cannot cope with the increased traffic. Having had a leisurely drive to Wimbledon, we were able to drop our car right outside the reception and walk straight to our table. VIP hospitality at it’s best. 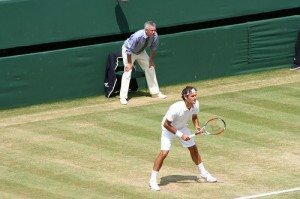 The main attraction was to see Murray and Federer play on the center court during the course of day. The Federer match seemed just a mass of huge serves and hard hits but not many rallies. Whether it was the hayfever pills or just the lack of rallies in Federer’s match, but I found it hard to keep my eyes open! Later on however during the ladies match with Safina the tennis at Wimbledon was far more entertaining and as a crowd, we were all Wowing over the length of rallies, stamina of the ladies and the strength of the shots. Safina was especially tall, her top not quite covering her stomach! Lots of blogs I see on other websites commenting on this. Finally at 6ish we all witnessed, under the new fabric roof, Andy Murray’s match against Stanislas Wawrinka. Talk about leaving the best to last. With the roof over, the public’s cheering seemed to echo around the centre court and that’s certainly what Murray needed. We were all sliding down in our seats, as Murray lost the first four games. Was this going to be another British whitewash? However, with nerves of steel and some brilliant rallies, Murray clinched the game which is now the record latest finish in the history of the Wimbledon Championships. I went away from the day very appreciative of the fact that if you wanted some lunch or tea, to come away from the hoards of spectactors to your own oasis of corporate hospitality at Wimbledon, is really a godsend and worth paying for. There are just thousands of people all looking for a seat, a beer, cup of tea or just to get out of the sunshine and there wasn’t enough around. To be able to step away from all this in your own hospitality area at Wimbledon is just perfect! Do come along next year to enjoy hospitliaty at Wimbledon for 2010.